River Valley sophomore Arika Barr (31) delivers a pitch during the first inning of Friday night’s 11-0 loss to Alexander in Bidwell, Ohio. BIDWELL, Ohio — Sometimes you hit, sometimes you don’t. 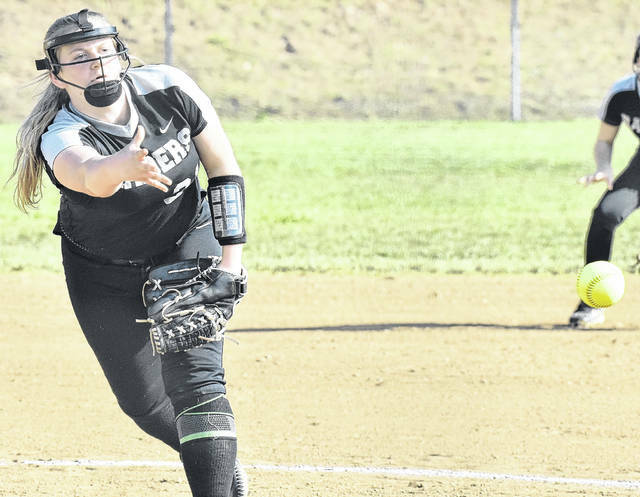 The River Valley softball team had only three hits, as Alexander earned an 11-0 victory on Friday night in a Tri-Valley Conference Ohio Division contest in Gallia County. 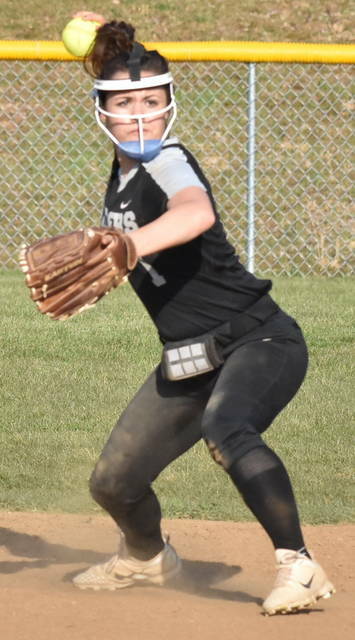 The Lady Raiders (3-3, 2-3 TVC Ohio) trailed the visiting Lady Spartans (7-2, 5-0) by a score of 4-0 in the second inning, as AHS utilized a pair of two out walks and hits to take an early advantage. The Silver and Black surrendered two additional runs in the top of the third frame, as the Lady Spartans extended their lead to 6-0 by way of four singles and a sacrifice fly. Alexander tacked on five more runs in the top of the fifth, by way of four hits and an error to take an 11-0 lead into he finale. River Valley’s Kasey Birchfield led off the bottom of the fifth with a single, but Alexander closed out the 11-run victory. Arika Barr suffered the loss for the Lady Raiders, as she allowed four runs on three hits, with three walks in 1⅔ innings of work. Sierra Somerville provided 3⅓ innings of relief and surrendered seven runs on 10 hits, while striking out four hitters. Isabella Mershon led RVHS with two hits, as Birchfield provided one safety. Gracie Hill earned the win for the Lady Spartans, as she worked five shutout innings, allowing three hits, one hit batter and three strikeouts. Hill also provided three hits and a run scored at the plate. Casto and Cooper each finished with three hits and two RBI to help lead Alexander offensively. Jadyn Mace had two safeties and drove in one run, while Ross and Howard finished with one hit apiece.